Fatherly Favorite – 2019 Toy Fair Award Mothering "Best of Awards for Families" Pull it, Bend it, SOLVE IT! Stretch your mind with this unique logic puzzle featuring Crazy Aaron’s Thinking Putty®. Each of the 60 beginner-to-expert level challenges will put your spatial reasoning skills to the test as you attempt to connect the dots for all 6 Thinking Putty colors on the Puzzle Grid. The paths can’t intersect, so you will need to stretch and pull each color along different pathways, over bridges, and around blockers to succeed. 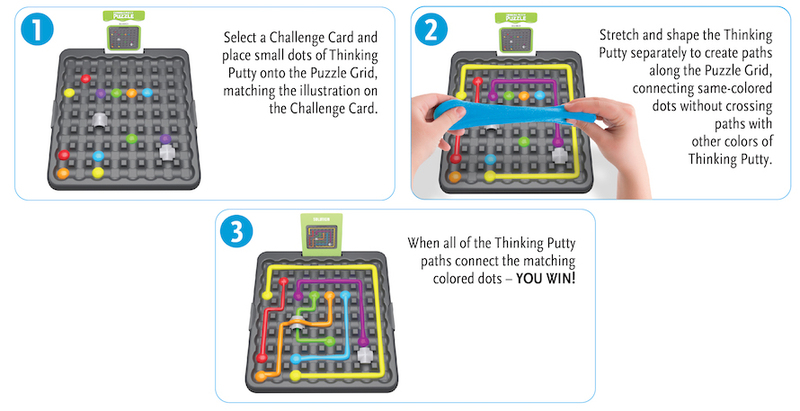 Includes 6 different Thinking Putty colors – featuring Binary Blue, a ThinkFun® Exclusive!